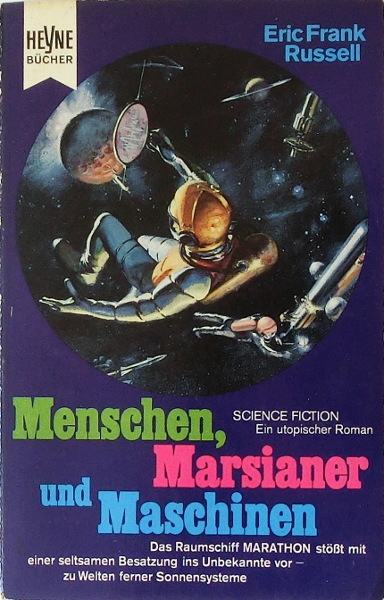 First German edition (not stated); there seem to be abridgements for some of the shortfictions. The title page states this as a novel. There are four numbered chapters that correspond to the respective original pieces. "Printed in Germany 1968" is stated on the copyright page. Month of publication from the editor's statement in Terra 546 (preview for Moewig and Heyne paperbacks). The last page of the final shortfiction (p. 157) is unnumbered. The price is not stated in or on the book, it was taken from Deutsche Nationalbibliothek. The cover art is not credit, the artist was found via the title's parent. The cover design is credited to Atelier Heinrichs and Bachmann.